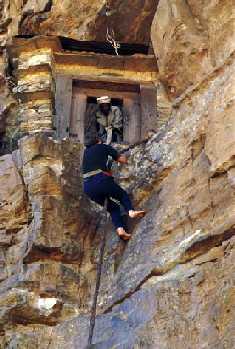 Debre Damo monastery is situated on an isolated mountain in northern part of Tigray. It is unique compared with most Ethiopian monasteries. Debre Damo was built, in the sixth century AD, with curved wood panels, painted ceilings and walls dedicated to the legend of Saint (Abune) Aregawi. The history of Debre Damo is centred on the "Nine Saints" who came to Ethiopia from Syria to spread Christianity in the Tigray region. 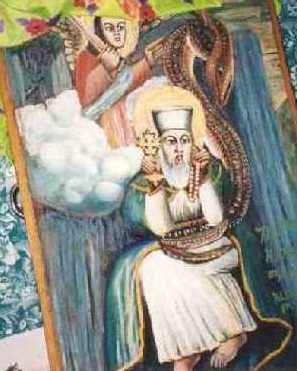 One of them was Saint Aregawi who settled on the mountain of Debre Damo. The other eight saints settled around Tigray countryside and all have their own church named after them. Debre Damo is magnificent in terms of its location and extensive collection of priceless manuscripts that have remained intact until today. It has become a prominent monastic and educational centre for the Ethiopian Orthodox Tewahedo Church. Many books have been written there and distributed to churches throughout Ethiopia.